There are so many things that I’ve been meaning to blog, and this little book is one of them. I made this adorable album for my parents for Christmas. Last year I lost a beloved cat to diabetes, and I still regret not having taken many good photos of him. 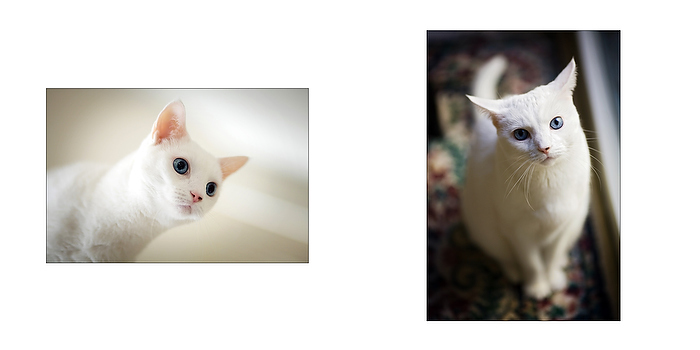 My parents’ cats are getting older, and I didn’t want them to have the same regrets. 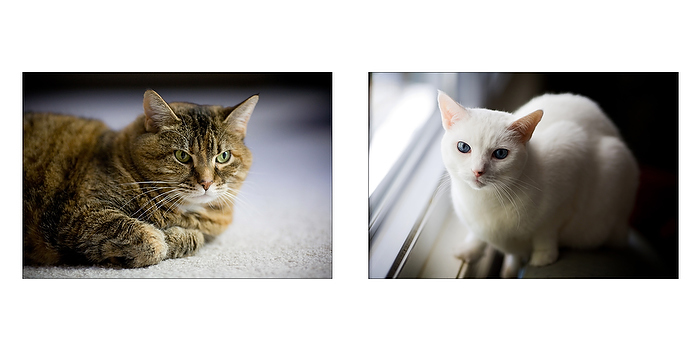 One day last fall I spent an afternoon doing a portrait session with their kitties while my parents were away. Then I surprised them with this book at Christmas. Now I need to do the same for my own pets! The cobbler’s dog and cat have no shoes. 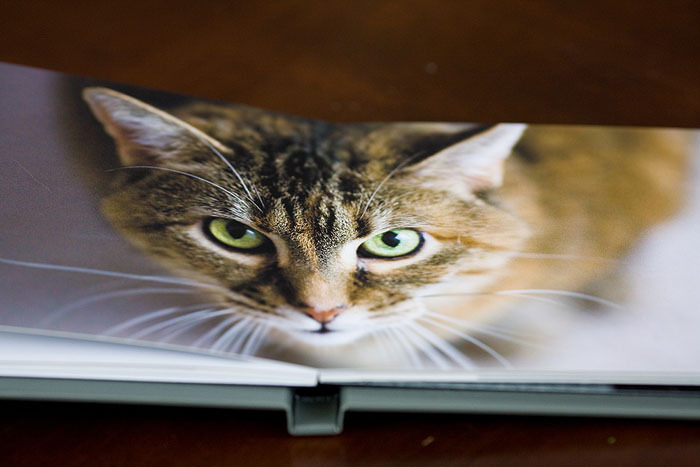 It’s a 6″x6″ fine art book. oh my gosh, that’s gorgeous. I really need to do another shoot of Raina. I did one several years back with my dad’s old Canon AE-1, and got some great shots. I keep telling my best friend that she needs to come out for a visit so we can take turns playing with Raina and taking photos. I’d love to get some shots of her in action. Thanks for the link to SharedInk! I will definitely have to check them out. 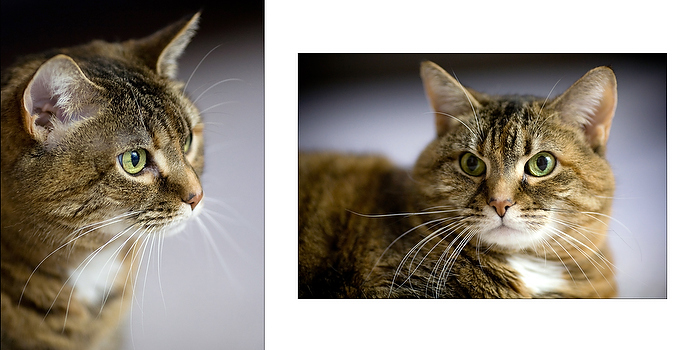 I’ve followed Gary, my “cat on loan,” around with my camera. With mixed results. I never seem to be able to catch her sleeping, except at night, and when she’s on the move, she’s fast. She’s a rather skittish cat at times. I’ll try the treat thing, and see what happens! Hey – Greenville is a nice city AND it would be within driving distance to your family in Virginia!! Aw, thanks! 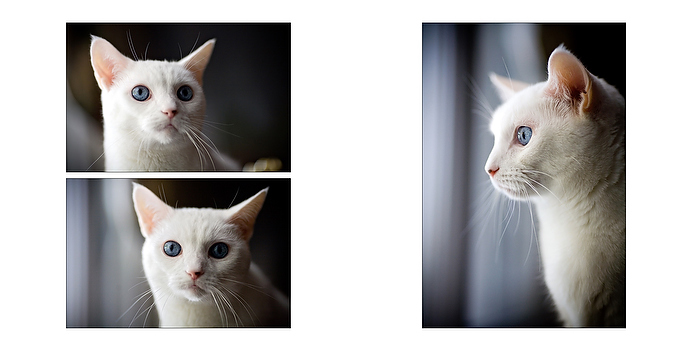 Cats are so fun to photograph! Will you bake for me? I need lots of chocolate in my daily life. I do love this album company, but they only work with professional photographers, sorry. 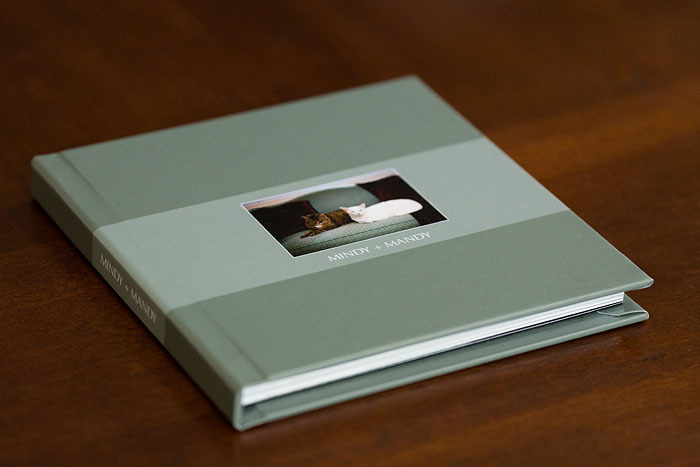 A photo book company that works with the public and makes beautiful albums is Shared Ink: http://www.sharedink.com. I use them for some of my personal books. I don’t know if they’ll be able to make a book that lies flat, though! 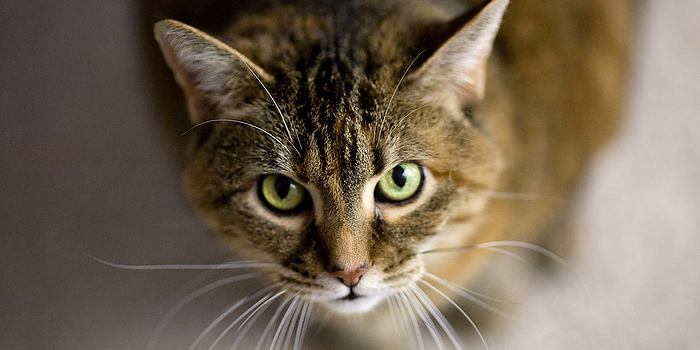 Wow, what a gorgeous photo of a beautiful cat! I love it! *big grin* Thanks so much! 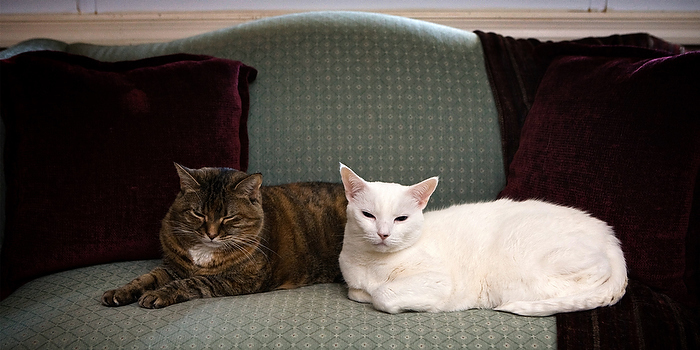 The great thing is that the two cats never sit side by side like that, and I managed to capture it! My parents were shocked. Thank you! I can’t wait to do one for our own little family someday. Yes, I use digital exclusively. 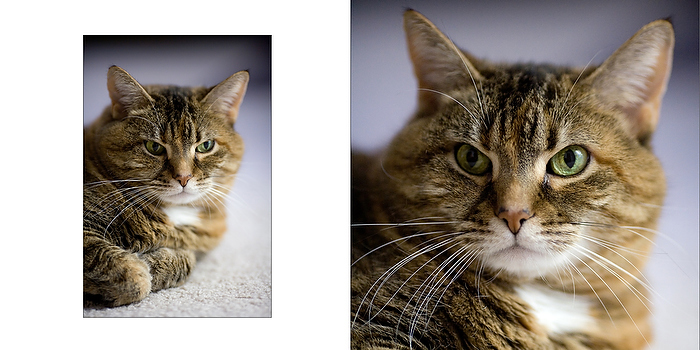 One trick that I use to get eye contact with pets is to hold a toy right next to my camera lens. Treats work, too. 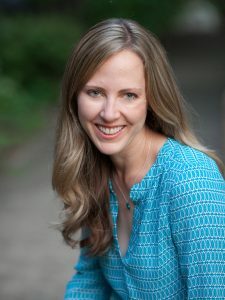 I used an album company that works only with professional photographers, but a company that I recommend for general use is Shared Ink: http://www.sharedink.com. 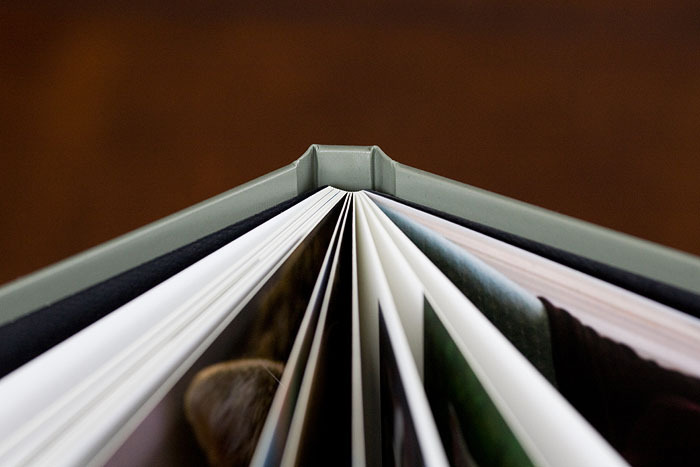 They make beautiful books with very high-quality printing. That’s so exciting that you’re shooting your first wedding soon. Feel free to email me at charlotte@charlottegeary.com for information about the albums. What a great idea! 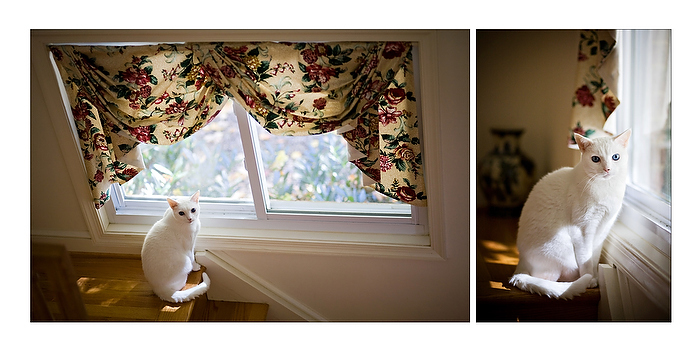 I’m really glad to hear that other people are making pet albums, because our little friends deserve it. You know I’d love to do that someday. 🙂 She’s a superstar. I’m really glad you think so! Thanks! 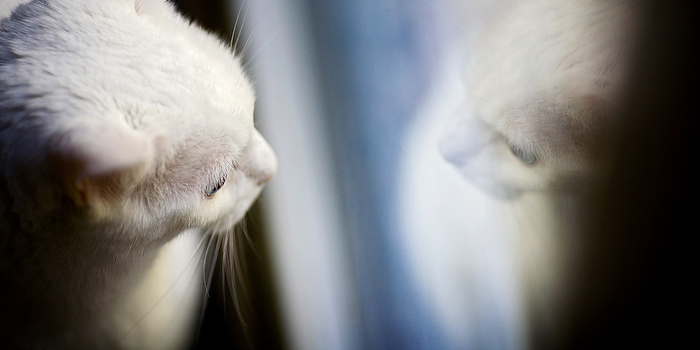 The reflection photo is one of my favorites. They really are! They are just wonderful kitties. Thanks! Now I need to make one for my own little ones! What beautiful work! And such a sweet thought — perfect for a Monday morning pick-me-up for me! 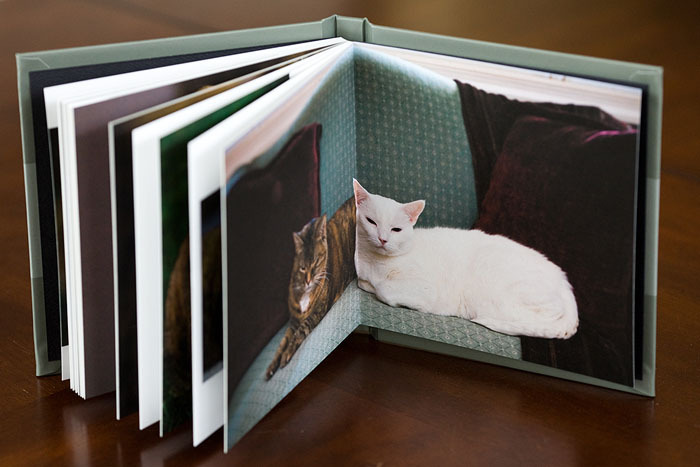 Mindy and Mandy should be delighted that their (human) sister Charlotte and (human) brother-in-law Mike took those pictures and put them together in a great album! Charlotte, first the book and the pictures are lovely. The cats are really beautiful too. Second, I was wondering if you would share the link that you used to purchase the book / layout and such. I have been looking for something that would lie flat when opened for my wedding pictures that I have yet to do anything with. I looked up “fine art book” but it hit too many other things. Great photos and what an awesome idea. Who do you use to make your books too? I did this for someone for Christmas. I think I used Snapfish. The book was nice but yours look nicer 🙂 Great job! 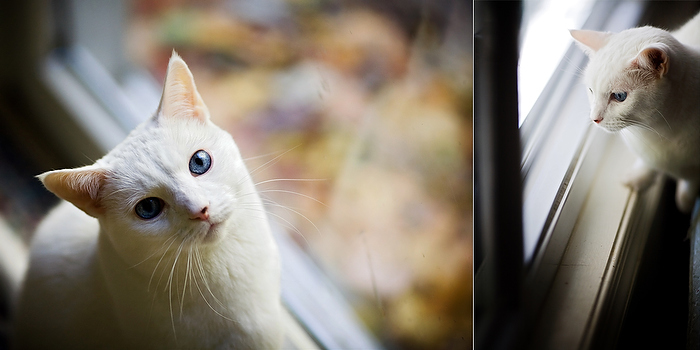 I just LOVE cats and those two are adorable. <3 You always take such a wonderful pics. Ok, I just need to say — that book is MADE OF AWESOME!! So beautiful! Oh come on! Posed on the couch with pillows and everything?!?! Freakin’ adorable. Why do you not live closer??? I would fund your retirement with photo shoots AND bake for you!!!! That’s so awesome. I love the pictures, great job. 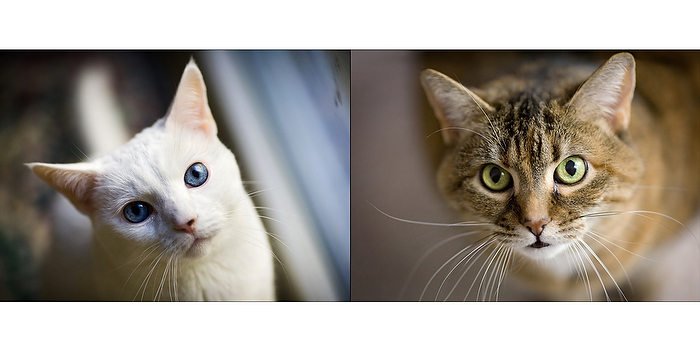 The cats are gorgeous. 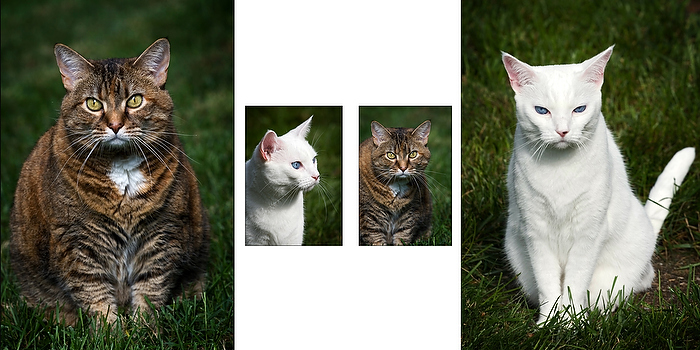 I love the white one with the amazing blue eyes. 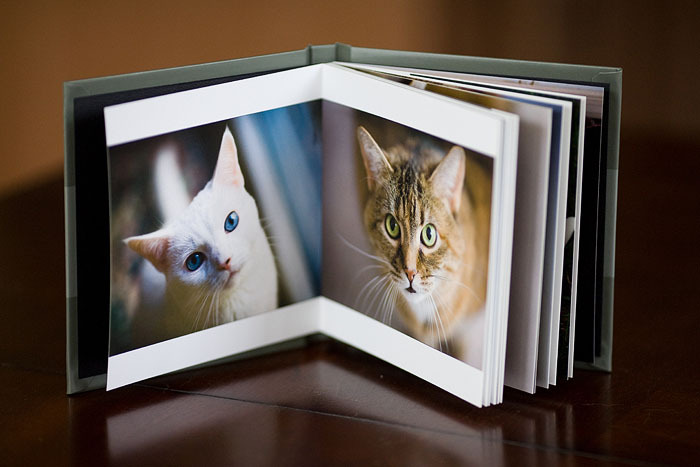 beautiful cats, beautiful photos, and beautiful book! Lovely! 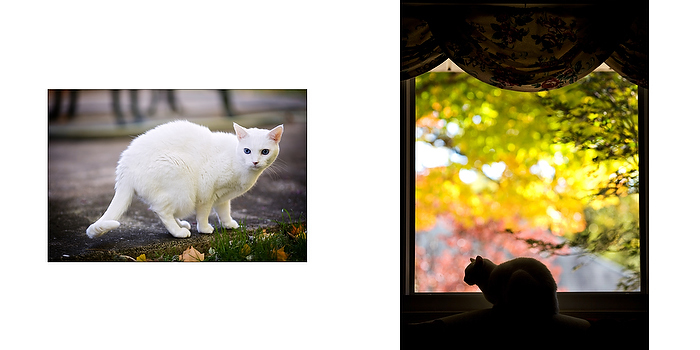 …both the photographs and the kitties. Now that I have a cat in my life (sort of; my boyfriend calls her my “pet on loan”), I extra feel warm and fuzzy looking at these. 1) Do you use digital? 2) How do you manage to keep them still? wow i really love the way you design your albums! can i ask a few questions? who do you use to make your albums and what program do you use to make the layouts for each page? i’m doing my first wedding in a few weeks and i would love a little feedback 🙂 thanks! ah! i want one! too bad i’m poor… and i live really far away. haha i love it! I love this!! 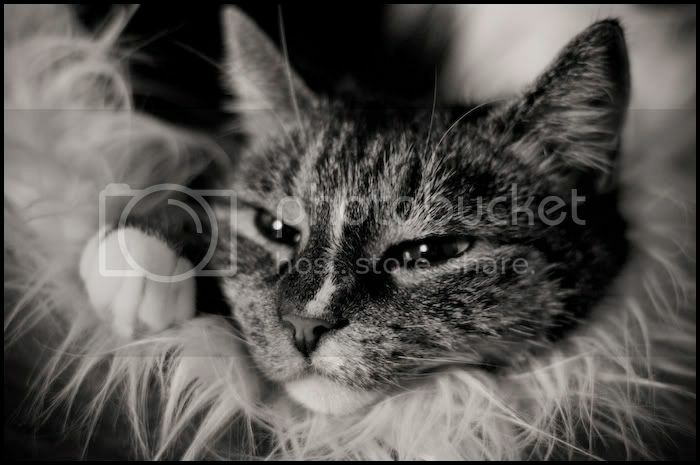 My parents have 6 cats now and I had a “photographer” friend come over last year and take photos, and I also gave them an album for Christmas (07). It wasn’t as lovely as this though, just a plain old 4″x6″ haha. OMG, this is my dream! I need a Charlotte Calpurnia book! the pic with the reflection is amazing! Your parent’s cats are much more cooperative than ours. 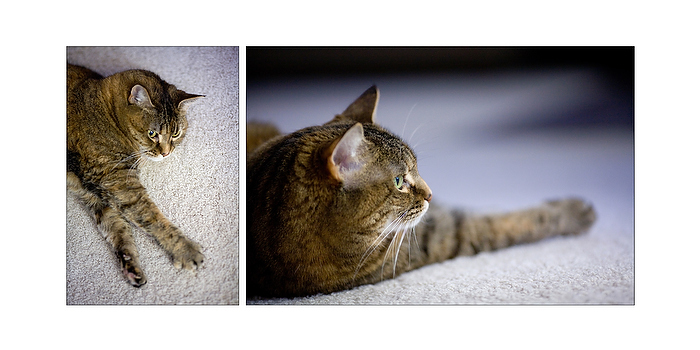 I’ve worked tirelessly to capture photos of her and she always moves the moment that I like the lighting/position! It’s like working with a toddler! Your parents cats are so precious! awwww – i love this!